Illuminate your favourite spaces with the Annick Goutal Candle collection, a range of divine ambience-creators that have been expertly crafted to provide the perfect aroma. Take your pick from a unique collection of delicately scented candles, all created with high-quality essences to offer you a special atmosphere at home. Regardless of your scent preference, an Annick Goutal Candle will be the perfect finishing touch to your day, offering a moment of complete tranquillity. At the end of a long day, enjoy the crackle and flame of the Goutal Bois Cendres Scented Candle and prepare to be transported to a mythical and mysterious wood where anything is possible. Refreshing and gently spiced, Bois Cendres Scented Candle evokes imagery of roasting chestnuts with its aromatic fragrance, calling to mind the warming image of a fire that spits glorious flecks of ash and embers before falling gently to an earthy floor of pine-needles. The sensuous smoke of the fire travels upwards to infuse with a sky of refreshing green leaves. With a subtle warmth, Bois Cendres Scented Candle will envelop your room with the spirit of nature. Relax into this musky fragrance and let it unburden you of stress with its deep woodsy base and opulent leathery accords. Bring the scent of a garden in full bloom into your home with the Goutal Une Maison De Campagne Scented Candle. Evoking the glorious aroma of a garden overflowing with a medley of blooming flowers, Une Maison De Campagne Scented Candle combines an array of floral notes to bring this unique scene to life. Elements of powdery sweet rose mix with a fruity undertone to create a refreshing, true to life scent that will infuse your space with stunning vibrancy. Inspired by nature and poetry, the beautiful blue pleated glass is created by cosmopolitan craft designer Tomas Alonso, and the elegant yet bold design reflects the unforgettable fragrance held inside. Capture the spirit of Christmas with the Goutal Une Foret d’Or Scented Candle, a scent that perfectly encapsulates the delight of the festive period. Warm and nostalgic, allow yourself to be transported to a festive walk within a golden forest covered in a bed of fresh snow. A scattering of light filtered through the tree canopy above, twinkling and joyous, brings a sense of peace and leads the way home. Resinous green pine branches powdered with snowflakes lie on the Christmas table next to a bounty of fresh mandarins, creating the ideal festive scene. Presented in a beautiful emerald green glass with pleated sides, the Une Foret d’Or Scented Candle will make a luxurious festive decoration in your home. The Goutal Ambre et Volupte Scented Candle invites you to relax and unwind from the day with its sensual fragrance that creates an intimate ambience of calm and opulence. Like stepping in from the cold, Ambre et Volupte Scented Candle calls to mind images of a cosy living room on a rainy night; the spit and crackle of the lit fire warms your bones as you curl up in your favourite armchair. Hints of spice blend with a soft vanilla base to create this tender scent, lending a delicate heat to create an overall effect that is rich, sultry and utterly classic. Immerse yourself in the peaceful serenity of time spent in nature with the Goutal Un Jardin Aromatique Scented Candle, a refreshingly cool aroma that will help you to unwind after a long day. Un Jardin Aromatique Scented Candle is inspired by a walk through the romantic Ninfa Garden in Rome, which is filled to the brim with floral delights and revitalising scents. Allow the natural zing of garden mint to invoke imagery of calm waters and a paradise of green splendour, whilst the balmy base of fig creates an earthy depth, instantly providing peace and contentment. 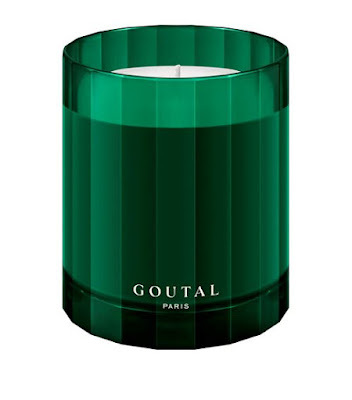 Housed within a vibrant green glass adorned with an opulent pleated design, Un Jardin Aromatique will allow you to bring the joy and essence of the garden into your own home. Capture the essence of an Italian summer with the Goutal Un Air D’Hadrien Scented Candle, a delightful aroma with a mix of citrus notes and powdery lightness that will be refreshing to the very end. Upon lighting the wick, allow yourself to be transported to an Italian landscape at sunset. Calling to mind sensuous imagery of golden light cascading across a scenic backdrop of cypress trees and rolling hills, the sun illuminates them in a fiery brilliance of inviting orange whilst you stand in the refreshing shadow of a lemon tree. Presented in a luxurious orange glass with decadent pleats, the gorgeous design reflects the intimate warmth held within the scent.